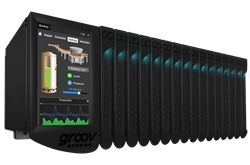 Combining reimagined intelligent I/O with an embedded Linux® real-time controller, gateway functions, and an integrated display, groov EPIC offers field-proven industrial hardware design with a modern software ensemble, to produce the results that visionary engineers want today. Connecting legacy systems, controlling processes and automating machines, subscribing to web services and creating mashups, acquiring and publishing data, visualizing that data wherever it is needed, and mobilizing operators—all of these are now within reach. In addition, groov EPIC simplifies commissioning and wiring and helps engineers develop rapidly and deploy quickly. Opto 22 designs and manufactures industrial control products and internet of things platforms that bridge the gap between information technology (IT) and operations technology (OT). Based on a core design philosophy of leveraging open, standards-based technology, Opto 22 products are deployed worldwide in industrial automation, process control, building automation, industrial refrigeration, remote monitoring, and data acquisition applications. Designed and manufactured in the U.S.A., Opto 22 products have a worldwide reputation for ease-of-use, innovation, quality, and reliability. For over 40 years OEMs, machine builders, automation end-users, and information technology and operations personnel have and continue to trust Opto 22 to deliver high-quality products with superior reliability. The company was founded in 1974 and is privately held in Temecula, California, U.S.A. Opto 22 products are available through a global network of distributors and system integrators. For more information, contact Opto 22 headquarters at +1-951-695-3000 or visit http://www.opto22.com. Follow us on Twitter, Facebook, LinkedIn, YouTube. All registered trademarks cited herein are the property of their respective owners.